This bottle of Pernod Absinthe is from the Spanish distillery in Tarragona. The bottle still has its original labels and can be dated around 1920. 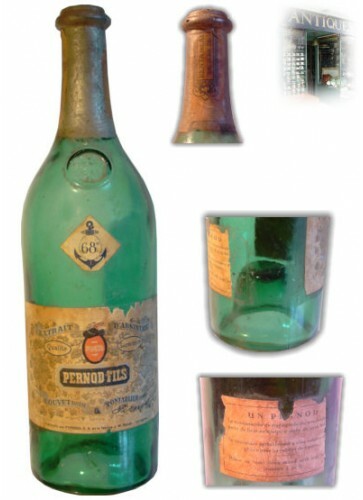 This vintage Pernod Absinthe bottle is from the Tarragona distillery in Spain. After the big burning of the Pernod Fils distillery in Pontarlier in 1901, a second plant was built in Tarragona, Spain. 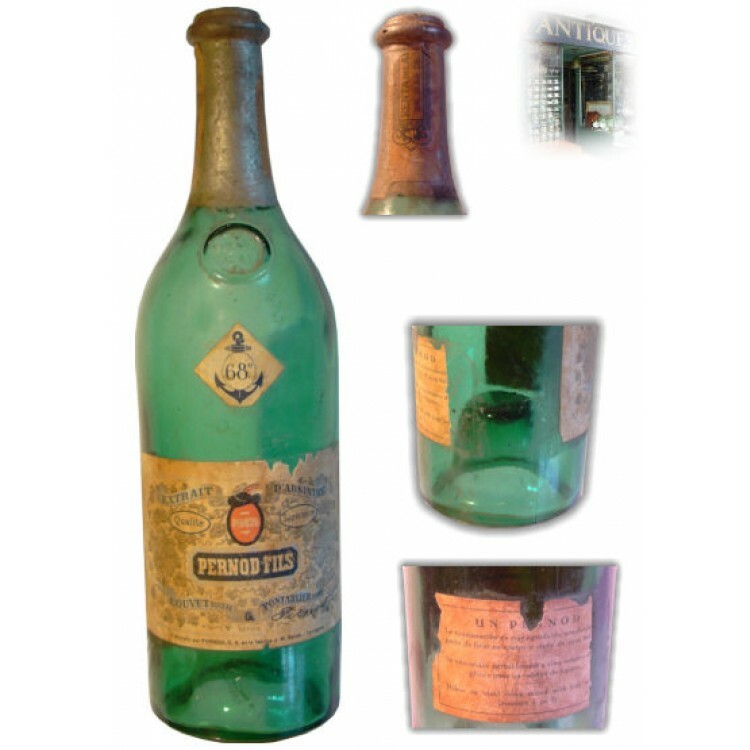 Absinthe was never forbidden in Spain, therefore Pernod was able to keep up the production until the late 1960’s. The Absinthe bottle is empty but in a good condition. The original front and back labels are intact and also the original alloy sealing at the bottleneck is still present. It can be dated around 1920 as the bottle bottom still has the larger conical shape. An absolute collector’s item. Pernod Fils was the most popular brand of Absinthe throughout the 19th century until the Green Fairy was banned in France in 1915. During the late 19th century, the Pernod Fils name became synonymous with Absinthe. The brand represented the standard of quality by which all other brands were judged. The beginning of this very special brand can be traced as far back as the 1790s. It was during this time in Neuchâtel, Switzerland, that Dr. Pierre Ordinaire created a distilled patent medicine that would represent the earliest origins of the Green Fairy. The recipe then came into the hands of Henri Louis Pernod through the means of a business deal, and in 1797, he and Daniel Henri Dubied opened the first Absinthe distillery in Couvet, Switzerland. Now, they began to commercialize Dr. Ordinaires medicine to a world known spirit. 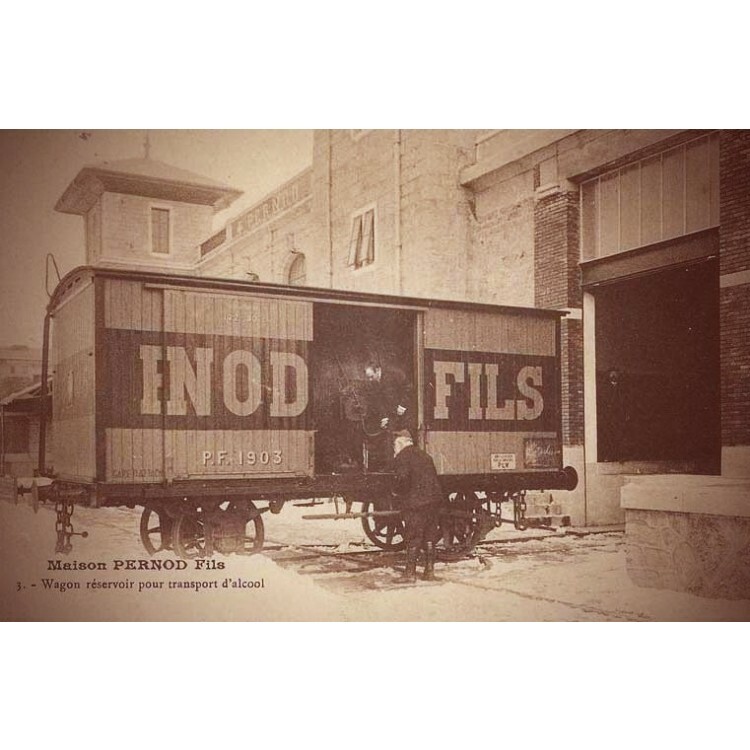 Pernod later built a larger distillery in Pontarlier, France, in 1805. This set the stage that would cause the sleepy community of Pontarlier to eventually emerge as the home of twenty-eight commercial Absinthe distilleries, and the world's center of Absinthe production.